Cover Drive is a band on a mission to bring the sunshine and sounds of their native Barbados to the world. In 2011 and 2012, the Bajan quartet, comprised of lead vocalist, Amanda, guitarist, Barry, bassist, Jamar and drummer/vocalist, T-Ray, successfully brought the sunshine-y feel good sounds of their Caribbean heritage to the UK music scene. 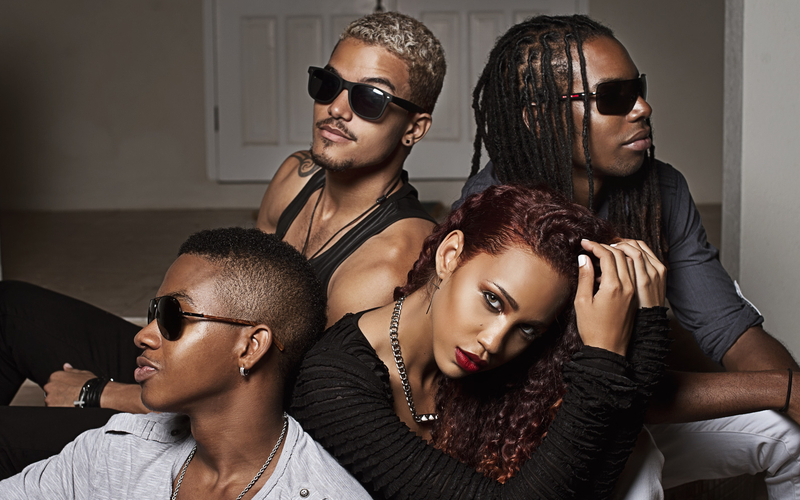 Labeled Carib-Pop (a fusion of Caribbean music and mainstream pop music), three of Cover Drive’s four singles hit the top 10 of the UK official chart. They had a total of five top 40 hits on the UK Official Chart. Their #1 hit single, ‘Twilight’, had UK natives swaying their hips to the tropical vibes. The band’s debut album reached #14 on the UK Official Chart. The band’s success also earned them several nominations in 2012: one Soul Train Music Award, three 4 Music Honors Awards and six Barbados Music Awards. Their celeb friends include the likes of Emeli Sande, Jessie J and Ed Sheeran. And both their fellow Barbadian mega superstar, Rihanna and world chart-topper, Kelly Clarkson, have allowed them to share their stage as main support acts. Not too bad for four kids who formed a band just three years ago in a basement in Barbados, at the suggestion of drummer T-Ray’s mom. In 2013, while the band was been busy working on their sophomore album, their hit song, ‘Turn Up The Love’ with Far East Movement, which has over 60 million views on YouTube, went double platinum in Australia and made it onto President Barack Obama’s inaugural playlist. The Bajans are still in shock, but wondering how many times President Obama would have mentioned their name in connection with the song. The band is working closely with the US Embassy in the Eastern Caribbean on their ‘No Witness No Justice’ regional campaign and recently wrote and recorded a theme song for it. This past May and June, the band was featured on an episode of House Hunters International on HGTV. This month, the band will be featured on an episode of Britain’s and Ireland’s Next Top Model. Cover Drive’s debut album, ‘Bajan Style’ is out now and available worldwide.